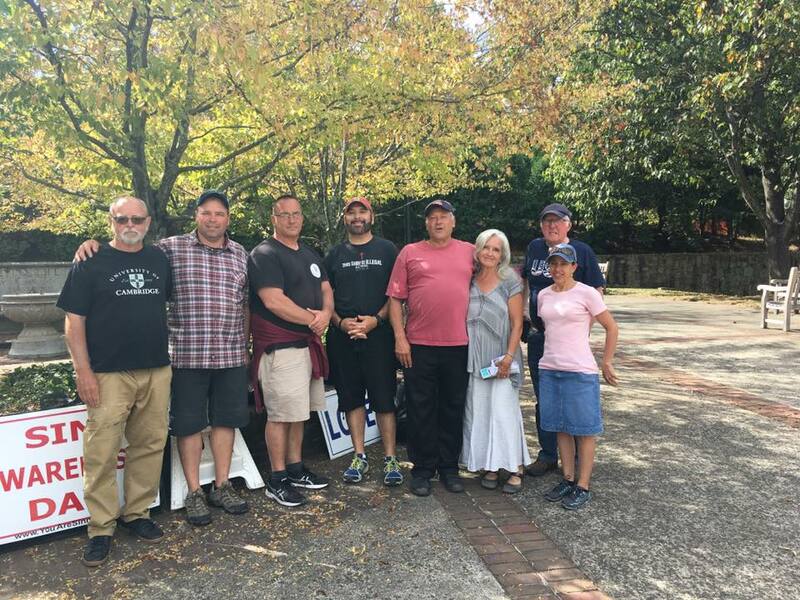 CHARLOTTESVILLE, VA – Our final stop on the tour brought some pleasant surprises with it. 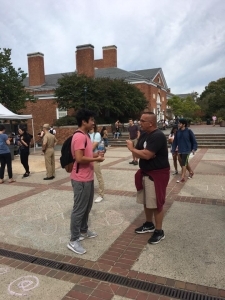 Previously when brothers Don Karns and Mike Stockwell had preached at the University of Virginia, they experienced mostly and apathetic crowd without much engagement. However, this was not the case as our day would get amped up and finish well. One of the best parts about open-air preaching is meeting other saints with the same conviction to labor in the fields. We were blessed to have Scott’s wife and another lady join our team at UVA. It was a privilege to labor with these sisters. Pattie and Mary were warriors when it came to contending for the faith in one-on-one conversations and never once backed down from hard questions or accusations by unbelievers. They were a joy to watch and learn from. One advantage we had that brother Mike and Don’s previous visit lacked was a captive audience. 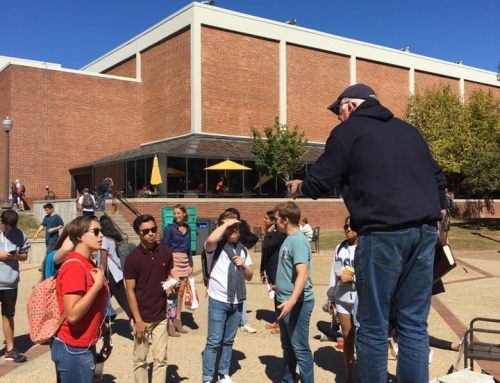 By God’s grace, we found a square in the middle of campus that was every open-air preacher’s dream. Along the perimeter, there were 4 or 5 food trucks parked. The students were gathered in lines waiting for food and then milled around eating. The great evangelist George Whitefield would have been jealous! It was akin to shooting fish in a barrel for sure. As the preaching was going on, many of us were engaged in one-on-one conversations. 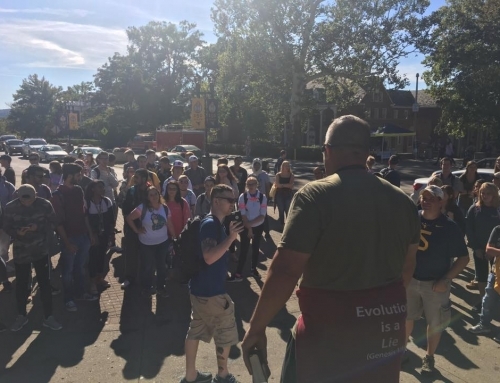 Pattie and Andy were ministering to a couple Mormon missionaries, Mary was contending with a group of students about abortion, Mike was encouraging a Muslim, and others were busy as well. 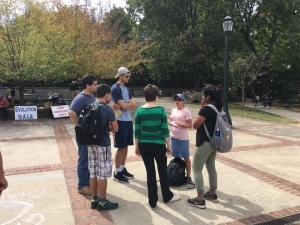 As I was handing out tracts, I noticed a coed who was very engaged in listening to the preaching. I noticed a peculiar looking cross around her neck and asked what she thought of the message – she was Roman Catholic (RC). After the introductory pleasantries, I mentioned that I was raised RC and I left the church because I could not reconcile many teachings with Scripture. We talked about the authority of Scripture which led to a brief discussion about the Reformation that she initiated! After several minutes of showing her common practices that do no align with Scripture such as infant baptism for forgiveness of sins, confession to a priest, purgatory, and Mary as co-redemptrix, she caught me completely off guard. She asked, “So what do you think about transubstantiation?” WHAT?! This is only the second time I have ever spoken with a RC that knew that word, let alone what it means. We continued to talk about transubstantiation for another 15-20 minutes. Afterwards, it was a good time to segue to the Gospel. After hearing the Gospel, she had to depart for class. I could see her eyes tearing up as she politely took a tract and agreed to continue searching the Scriptures for truth. Pray for Gwenie. Eventually it was my turn to preach. 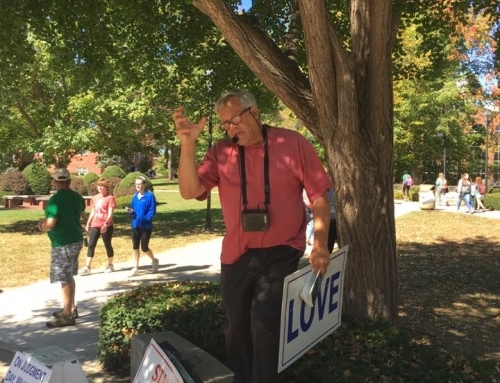 As Mike finished up, his bold and accurate proclamation of the Gospel has many bystanders worked into a frenzy. 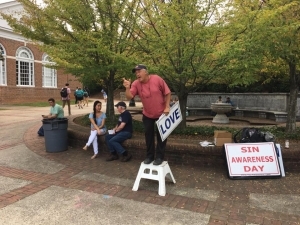 By the time I began, there was a group in the middle attempting to drown out the preaching with such classic hits as “Twinkle, Twinkle”, “Old MacDonald”, and “The Alphabet Song”. As usual, what the enemy intends for bad, God uses for good. The choruses from the Mother Goose Choir only attracted even more students closer in to our group to hear the Gospel message. One of those drawing in was a young girl who was very confused about Christianity as a whole and the Gospel specifically. Thanks to the singers, she drew near to me and we ended up having a wonderful conversation about the Gospel for almost 30 min. She seemed receptive and understood why she needed a Savior and why Jesus was the only one who could save her. 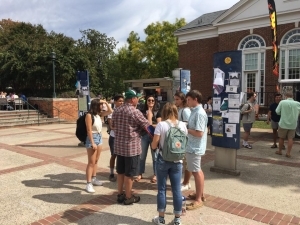 As she left, she apologized for her fellow students and with watery eyes, left with a Gospel tract agreeing to seek God in prayer. Pray for Courtney. As I was trying to reason with them, UVA’s version of Sheldon Cooper burst on the scene in the middle of the circle. One thing I noticed immediately is that he was very intelligent. He even had many parts of the Bible memorized. Yet he was a professed atheist and completely on board with the Big Bang theory and evolution. I challenged him on knowledge and truth. Again, the absurdity of not believing God is not hard to see when you ask some simple questions. Like the fellow at VT the day before, the young man too affirmed that he was “absolutely sure absolute truth does not exist” and that there were no absolutes. He continued to press the evolutionary world view. One thing I’ve learned is that many college students only have a surface understanding of a couple quotes they’ve heard and come off all-knowing. Yet asking questions so they can back their claims seems to dismantle their world view pretty quick and remove their credibility of those around. After his mantra about evolution, I remarked that I’m a pretty simple guy and if he could explain irreducible complexity to me. He lost his mind. After a few curse words, he trailed off and I was able to continue discussing homosexuality and what Jesus said about it with the rest of the group. By day’s end our team was famished. Because of the nature of open-air ministry and the closeness it breeds as support from many churches is few and far between, going our separate ways to our next assignment is bittersweet. We talked, hugged, and prayed and set out to go our separate ways. We smiled through the tears and pressed on to our next destination. For our first Fall College Tour, God was extremely gracious and faithful to us. From traveling mercies to favor with the authorities, God had every base covered at every corner where something could go wrong. Many churches and brethren prayed for us and we could tell. 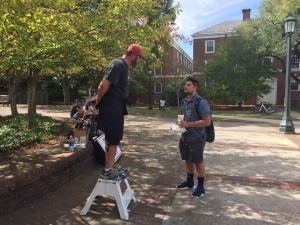 Pray for those who got a tract or heard the Gospel message in some way that God would use our efforts to reach His elect.